The governor joined Kamehameha Schools officials for the Keauhou Lane groundbreaking, a 209-unit rental project. Whether it’s a studio rental or a home for a growing family, what can be done to provide more affordable housing across the state? Governor Ige wants folks to know he hears them and is taking action through public-private partnerships and improved financial tools to increase production. From O‘ahu and Maui county to Kaua‘i and Hawai‘i island, more than 20 rental and affordable for-sale projects have opened in the last two years or are in the pipeline for the future. Many of the projects target residents whose incomes are at or below 60 percent of the area median income (AMI). On O‘ahu, that would mean a family of four making about $60,000 a year; however, median income levels vary by county. Examples of moderate-income rental housing include The Flats at Pu‘unui in Kaka‘ako, which offers apartments starting at $1,375 a month, and Keauhou Lane, currently under construction. For-sale developments at the 80 to 140 percent AMI (up to $140,700 income) include Kapiolani Residence near the future Ala Moana rail station, Hale Ohana in McCully and 803 Waimanu in Kaka‘ako — all projected for completion in 2018. The 60 percent AMI and below rental category includes Kaniko‘o Rice Camp for seniors on Kaua‘i, which offers a one-bedroom unit for $851 monthly or a two-bedroom for $1,022. At Ko‘oloa‘ula in Kapolei, a one-bedroom apartment rents for $885 a month; a two-bedroom is $1,020. Other projects, such as Hale Kewalo, are in the pipeline. Improving policies, maximizing financing tools, and leveraging state funds to make it feasible for developers to build affordables through HHFDC and the Rental Housing Revolving Fund. 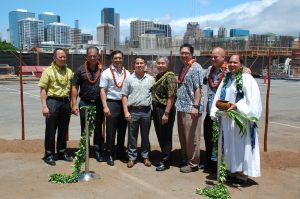 Working with the Hawai‘i Community Development Authority (HCDA) to produce more affordable units at lower income levels in areas such as Kaka‘ako. In public housing, using special work teams to expedite the repair backlog for very low-income families to make more units available faster. Taking advantage of state lands along public transit lines to develop mixed-income housing units. 1,050 affordable units produced over the past two years, more than 92 percent of which are rentals — the area of greatest need. 4,000 more units in the pipeline, 76 percent of which will be rentals. $180 million set aside in private activity bonds to develop these affordable rental units, more than double what was invested in the past. In FY 2016, the state’s HHFDC helped 814 families with Mortgage Credit Certificates, tax credits for first-time homebuyers — and 4,669 families over the life of the program.